MNN/WCSG team gets ready to head to its first stop in Guatemala. Today was day one of our Guatemala trip. There are 26 people on the trip, which is made up of Mission Network News and 91.3 WCSG listeners. We all met for breakfast at 8:30am. The hotel we’re staying in is one of the nicest hotels in the area. The owners are Christians and they give Orphan Outreach a great rate. So, we stay here. Breakfast is your typical American breakfast — eggs, bacon, french toast, you name it. It was good. Soon after we ate, we met in the lobby for our first stop. We were split into two groups — group A and group B (original names, I know) and boarded our buses. Much of the bus trip was spent shooting pictures. 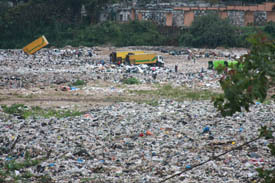 A view of the dump from the school/day care center. We traveled nearly 45 minutes to a dump. That’s right, a dump. The reason? To visit a school Orphan Outreach is supporting NEXT to the dump. Because there’s such poverty, people (many single moms) go through the dump looking for anything of value. They collect it and try to sell it to provide for their families. They’re street people. In year past mothers would take their children to the dump. But, now, there’s a school/day care center that’s allowing the kids to go to school, while mom works sifting through refuse. They work hours just to find enough ‘stuff.’ We were told it amounted to nothing more than a $1 a day. A few months ago, there was a collapse in the dump that killed more than a dozen people. 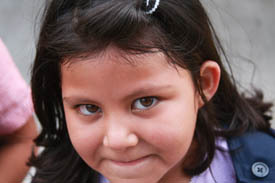 A little girl at the school by the dump. 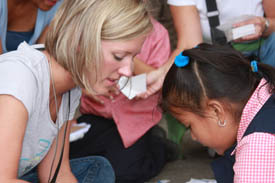 The school is actually run by the wife of the Guatemala City’s Mayor, who is a Christian. It’s a government run school, and Christians are welcome. Obviously the children are very happy. The children are dropped off at school/day care every day. They’re cleaned up, put on school uniforms, given a healthy meal, given a good education and they hear the Gospel by either staff members or volunteers from the local church who are actively involved in the ministry. It costs a parent 50-cents a week to put their child in school here. Since their parents only make about a $1 a day, that’s a significant contribution to helping their kids break the cycle of poverty. Mandy Phillips helps this little girl with her lamb puppet. As part of the trip, we spit up into groups to hold a modified daily vacation Bible school. One group told a story about the lost lamb. Another group did games. Another help kids with a craft. They made lamb puppets out of paper bags. And, the final group did a fun activity like painting the girl’s finger nails, blew bubbles or some of us just took pictures of the kids so they could see themselves. Digital cameras were the best invention when it comes to interacting with kids. Most love getting their picture taken. There was lots of laughter and even a few tears when some came to the realization that ‘school’ was actually the only safe place they had each day. This was the place it all finally ‘clicked’ and got ourselves focused on the task ahead. From there we went to lunch. Then, we traveled to a girls school. There were 200 girls registered, but only 90 were in school today. We were told that gas prices prohibit these girls from coming to school every day. We did similar activities at the girls school. Girls jumping rope. First one to 20 wins. 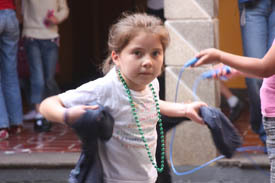 Little girl gets ready to go home. Greg with girls at the school. Welcome to Guatemala. 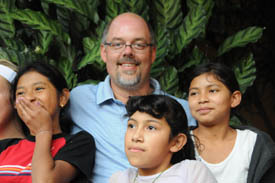 I am a missionary in Guatemala for the past 13 years. i also work with the poor and children. People don’t realize how poor this beautiful country is. thanks for blessing us by your presence and bring Christ along. I’ll be following your trip by your blog. Thanks for being willing to go. Wish I was there. 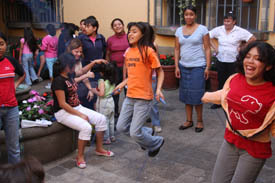 It so warms my heart to once again see the beloved children of Guatemala. 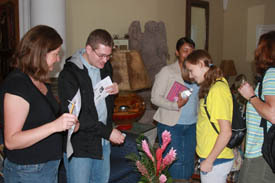 I left a piece of my heart there after participating in a short term mission trip in 2005. I was blessed to be able to help build the first Habitat Home constructed in Chiquimula. 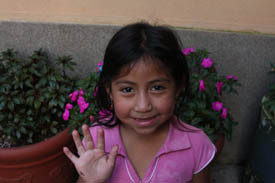 I have a sponsor child in the village of Camotán, Chiquimula, and another family that I keep in close contact with there. They are part of my own extended family. I truly love this country and its people! Perhaps in the future I will have the opportunity to travel with MNN on a return trip. What a joy that would be! Praying God will use all of you mightily to touch lives and share Christ. Hello Greg, I was reading your blog and read the symptoms that you experienced in the church (heart pounding, dizzy, feeling like you were going to pass out)… sounded very familiar to me as I used to have the same symptoms… usually when I was overtired. These bouts were happening more and more often and lasting longer each time, so I stopped at a nearby hospital during one of the episodes and they had me see a cardiologist that told me I was having heart palpitations and recommended that I could either take topral (sp?) the rest of my life or could have a procedure done called a catheter ablation. Fortunately I live 40 miles from one of the hospitals that does this procedure and I chose to have the ablation and have been symptom free for a couple of years. Of course you could be experiencing something entirely different, but I thought I would pass this along. Feel free to contact me if you would like more detailed information. Lord Bless!